Six young refugees talk about their escapes and trips, as well as the new problems they encounter in Luxembourg. Mos Stellarium is a poetic documentary about Dzemil, Milena, Anna, Yunus, Rijad and Eko. In all intimacy, they tell their stories as young refugees. Attached to the travelled landscapes and all the encounters, the memories look back at these strange journey and turn to the future. It is, in a way, the human existence in a universal sense. Like mysterious maps of constellations, their voyages began in Afghanistan, Syria, Kosovo or Montenegro. They headed for Europe, Luxembourg in particular, and their destinies turn them into young adults by accident, but full of dignity nonetheless. Karolina Markiewicz and Pascal Piron form an artist duo and both work as teachers. Karolina Markiewicz is also an independant art critic. Since 2013, they work together on several projects, including kulturstruktur.com/videotalks, a blog with interviews about artistic creation with persons from various fields (cinema, theater, music, dance…etc.). Their first collaboration was the creation of an exhibition for AICA Luxembourg : Everybody should have the right to die in an expensive car (2013-2014). Currently they present a new exhibition Some people cried, some people laughed, most people were silent at Neimënster in Luxembourg, where they are also preparing a theatre play: Philoktet by Heiner Müller/Sophocles. They directed a first documentary in 2014: Les Formidables, which was shown at Rencontres Internationales in Paris (2014) and Berlin (2015). 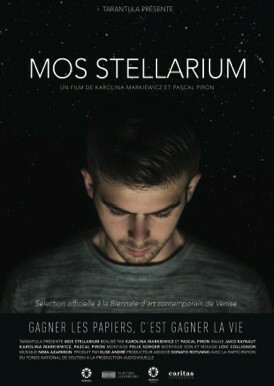 Mos Stellarium is their second movie. A video installation with extracts of Mos Stellarium is currently shown at the Kunstmuseum Liechtenstein in Vaduz, and will be part of The Silver Lining, a collateral event of the Biennale of contemporary art in Venice.